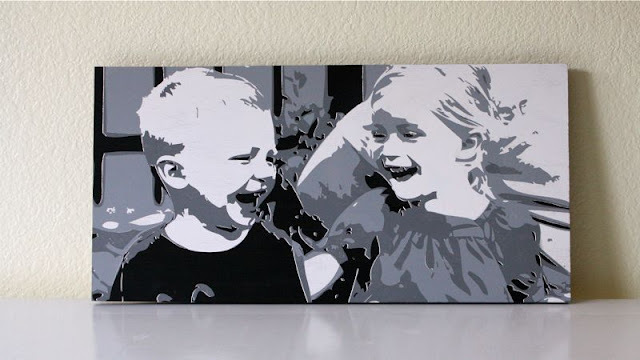 Do you remember the cool painting of Lucy and Owen that I shared in November, made by Modern Bird Studios? It now hangs on our family room wall, so I can smile each time I walk by it. And...the Modern Bird folks are at it again! They've opened a whole new line/addition to their site called: MOD TOTs, aimed at specifically at kid's decor. And seriously, their designs are really cool. Totally my kind of kid art. They sent me a few pieces to try out and I had the hardest time choosing only 3! Robots?? Animals?? I didn't know which I loved more. But today we'll let you decide, so YOU can try them out as well. 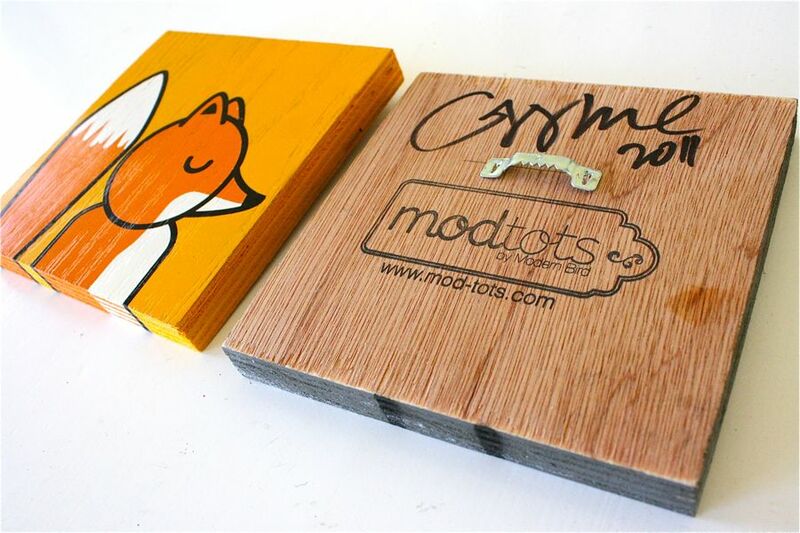 These Mod Tot pieces are the same quality as the Modern Bird painting, created on pieces of wood with beautiful paint colors, signed on the back and ready to mount on the wall. (and stay tuned for Bugs, Dinosaurs, Sweets & Confections, and Mystical Creatures, coming soon!) You can always stay updated with them through these Twitter, Facebook, and blog links. Their site is really easy to use. Just click on an character you like and then you can choose ANY background color you like. Pretty cool. I like options. And the other thing I like....the paintings I chose are smaller than you might think. But in a "good/small" kind of way. There's Owen's hand with the zebra. The small size--6x6 inches--adds a subtle colorful touch without overpowering the room, especially with a few of them hung together. Of course you can also order the paintings in larger sizes as well. Ready to try them out?! * $100 Gift Certificate to one lucky winner, so you can pick out exactly what you'd like from the shop. 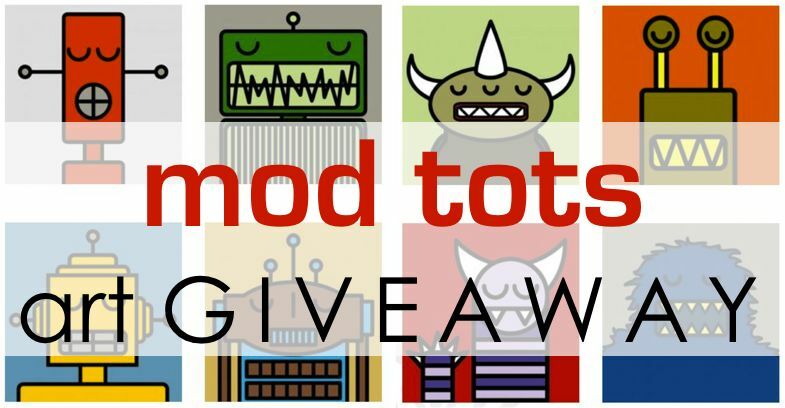 * Giveaway ends Sunday 3/13/10 at 6pm (Central Time). love these! thanks for the giveaway!! I love the sleepy owl! all of them are so adorable! Love these! They would look great in my boys' room. Stinking cute! I just did my son's room in robots- I'd love to finish it off with some awesome Mod Tots paintings. SO CUTE! Would look fab in my 1 year old's room! These are so cool! Thanks for a chance to win! Oh, what a cute pictures! This I must participate. 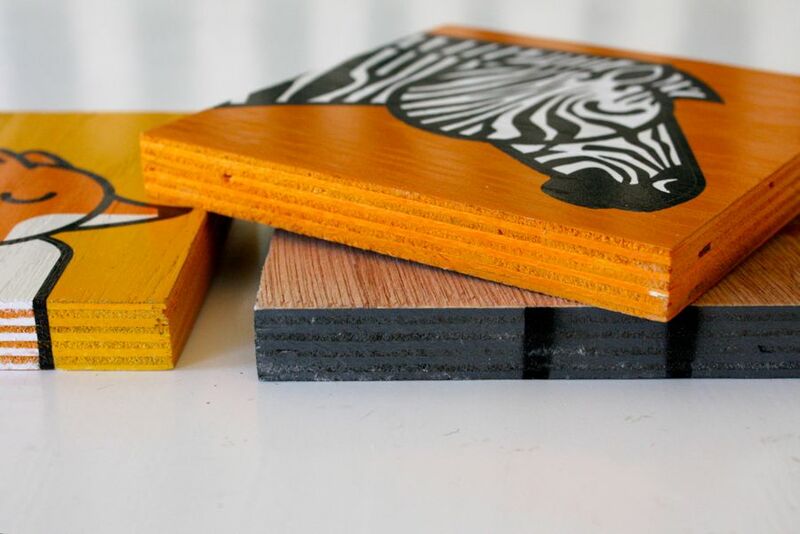 These are really, really cool! They would look great in my boys room. I absolutely love these ~ especially the robots for boys! Thanks for the chance to win. given that my girl loves any and all animals and my boy is just about to have a robot birthday party, seeing these just made me squeal in delight! Thanks for emphasizing the size. Adorable! I love the robots. I have been eying them for a while now. These are so great! I think I have new inspiration for my kids' room that I'm currently decorating. Awesome, I'd love to win one of these! I *HEART* THE OWL AND GIRAFFE. AND ZEBRA. AND WEE BIRDIE. AND, OH HECK! LOVE 'EM ALL! GREAT G-WAY! These are just darling! I think I'm with you; I adore the animal. Thanks for introducing me to these! So modern and fresh! Thank you! Oh how I love the giraffe and zebra one! Perfect as I am about to start to decorate the nursery. adorable!! 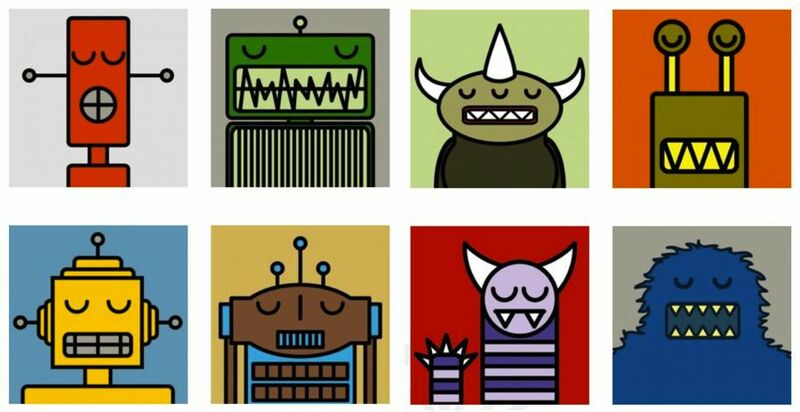 I'd love to have some for my son's new "big boy room"
The monsters and robots are really cute. My son would LOVE the a robot one! What fun and colorful art! Thanks for the chance to win this! So hard to choose what my boys would like best! So fun! Once our new house is done I hope to plan out our boys room a bit better! what great toddler room/play room artwork! I've been looking for robot art - this would be awesome! The robot ones are pretty cool! Adorable!! I know just which ones i want. Oh so cute! Loving the giraffe & the owl. oh my! The robots and monsters are FAB! The robots make me smile! i'd have to get the little fox... or any of the other creatures! I love them all but the money stands out to me . Love them ALL!!!! Gosh I can not decide!! So cute!!! Thanks for the giveaway! I would like to have one of the monsters for my MONSTER. They are absolutly stunning. I love the animal ones a lot. LOVE the robots & monsters, so cute!! Thanks for hosting this giveaway, Dana! 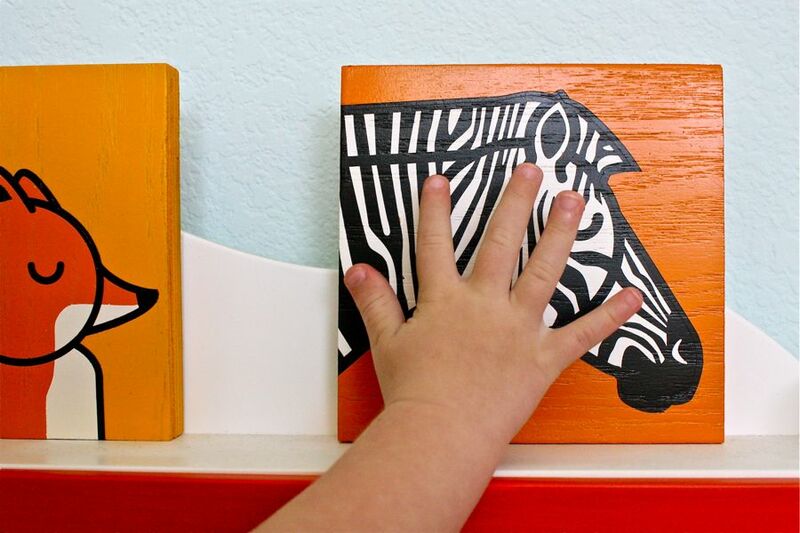 I'm just in the midst of decorating our nursery before baby comes in June - these would be great! uber cute - love 'em! Too cute =) I'd love to have one hanging in my house! so cute! this would be great for my nephew. I LOVE Mod Tots. So great. elliemakesit (at) gmail (d0t) com. These are all awesome! My boys would definitely choose the monsters and robots! Ooooh! So cute! And my little man really needs something on his walls! So Cute! Need them in my new nursery! I've seen this panda everywhere and love it! Are you kidding me!? Those robots are AWESOME!!!! So cute! I love the owl! These are super cute. I would love to put robot pictures in my soon to be little boys room. Oooh I've been admiring these paintings for ages! Fingers crossed! These are really cute! Great addition to any childs room!! Love so many of them! Probably I'd pick something for my youngest son's room! Those robots are adorable. They'd look so great in my little guy's room! I LOVE love live this art! I went back and read the Lucy and Owen art post, and now I know what city you live in!!!! Don't worry im not a stalker, I just grew up there too! I love that town and miss it terribly. If I won the drawing I'd let each of my sons pick out a monster or robot! (i accidentally typed "sins" which made that sentence Really weird.) I have three sOns so they'd each get one! One more tip for YOU Dana! Go to that building that sits in the middle of Congress and go to the fourth floor. Drop a paper airplane straight down and sometimes it will spiral all the way down! These are adorable..thanks for the chance to win! These are amazing! I absolutely love them! I love your blog! I discovered it forever ago but never followed it and I rediscovered it the other day and I am just in love with all the things you and your guests do! And I definitely love the Mot Tots. We are slowly trying to decorate our house, room by room and I know these would be adorable in both my boys rooms! I love the robots and the monsters! These are amazing, I would love to win!! I can't wait to see what else they come up with also because everything is fabulous! LOVE these! It's so hard to pick which ones I like the best! what great art for any room! These are awesome! So cute! you always do the best giveaways! Oh I love these! Thanks for the chance to win! These are fabulous. I'd love to see a knights and dragon series. The sleeping animals are my favorite. Thanks for the chance to win. Absolutely adorable. I'm totally into robots and monsters lately. These would be so cute in my little guys room. Thanks for the awesome giveaway. Hope I win! I want, I want, I want. These are absolutely A-DOR-ABLE. these are absolutely adorable - love the robots!!! these are sooo cool! my boys would love them! These are so fun! I love the bright colors they used. 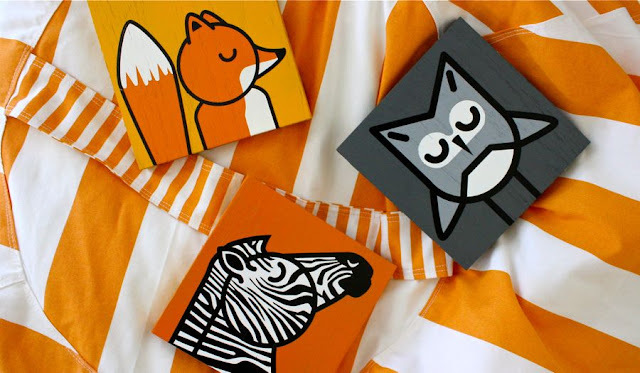 Super cute... would love these as I am changing our baby room to the big boy room. Love these! So dang cool! 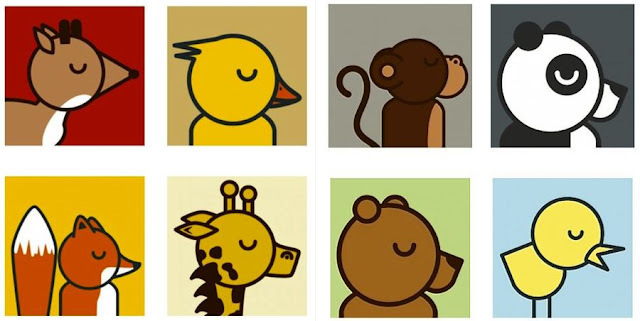 Super cute :) I like the animals the best. I think my son will love these. Oh neat!!! I love those robots and monsters and so would my boy! I have a shared bedroom for my daughter and son and I think the animals would be perfect. It's hard because I don't want it to be too boy or too girl. I love them. These are absolutely adorable! Thank you for the chance to win! These would look sooo cute in my son's bedroom. How fun and creative! Thanks! I can't decide which ones I like the best! OH! We are expecting another little one and the two dears will have to share a room. This will be just perfect for them!